BETTER PRODUCTION Shops Using Technology 110 MMS December 2017 mmsonline.com repeatability of workholding such as clamps, pallets and vacuum chucks. This, combined with the machine's large work envelope, means that the machine bed can accommodate multiple fixtures or setups. If operators are in the middle of producing a batch of parts and a rush order comes in, they can either use empty space on the bed or remove a fixture, replacing it when the rush job is complete and picking up where they left off. Another feature that Mr. Fisher says has helped speed machining of production parts is the abil- ity to use ethanol as a coolant. The rigging parts he is now making will be welded to the boat's outriggers, and he has been impressed with the quality of the parts as they come off the machine. The ethanol coolant evaporates, so the parts can go straight from the machine to welding with no post work. "They're just clean and ready to be welded," he says. "That's a huge time-saver." 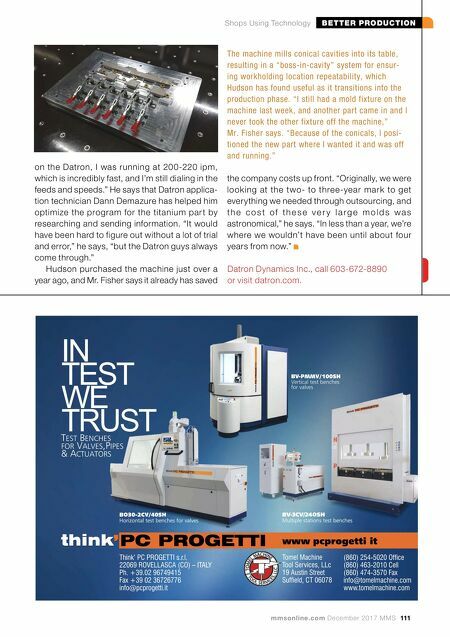 Hudson also purchased HSMWorks 3D CAM software, which Datron integrated into the MLCube during installation. This has enabled the company to bring its programming in house. "Before, we were outsourcing everything, so even if we did a mold in house, we were still outsourcing all of the programming," Mr. Fisher says. He says he has found the software easy to use, even though his only previous experience was in 2D programming. Hudson also plans to use the machine to cut titanium. 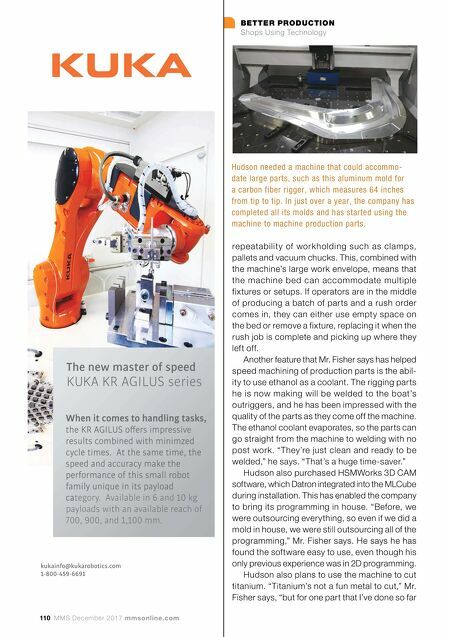 "Titanium's not a fun metal to cut," Mr. Fisher says, "but for one part that I've done so far The new master of speed � KR AGILUS series When it comes to handling tasks, the KR AGILUS offers impressive results combined with minimzed cycle times. At the same time, the speed and accuracy make the performance of this small robot family unique in its payload ca category. Available in 6 and 10 kg payloads with an available reach of 700, 900, and 1,100 mm. kukainfo@kukarobotics.com 1-800-459-6691 Hudson needed a machine that could accommo- date large parts, such as this aluminum mold for a carbon fiber rigger, which measures 64 inches from tip to tip. In just over a year, the company has completed all its molds and has started using the machine to machine production parts.